Joe Rainmaker is your top sales executive - he brings in a major percentage of your annual company revenue. A month ago, he was in a terrible car accident and he's still in the hospital. Your disability policy says he must be either "unable to perform at least one material duty of his regular occupation" OR he "must be unable to earn at least 80% of his pre-disability earnings." He's still receiving income from sales he made before the accident, so even though he's in the hospital, he hasn't experienced a loss of income. 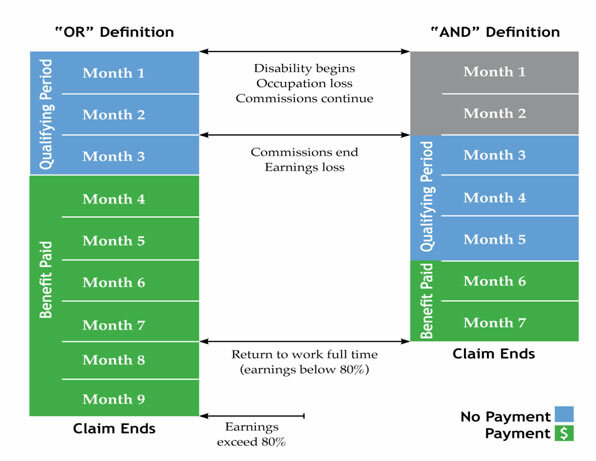 Assurant considers him disabled from the date of the accident regardless of his earnings, so benefits start as soon as the qualifying period is satisfied. Other policies may not consider him disabled yet, because they could require both the occupation loss and the earnings loss. This example is for illustrative purposes only. Policy language controls coverage and benefits.